The first meeting of the Scottish Parliament was held on 12 May 1999, with Donald Dewar (1937-2000) as its First Minister. This momentous historic occasion was the first time that the country's legislature had met in Edinburgh since the Treaty of Union with England had adjourned the first parliament on 25 March 1707, and transferred Scotland's law-making process and political representatives (MPs) to the Palace of Westminster in London. Donald Dewar, whilst Secretary of State for Scotland in the New Labour administration elected in 1997, was responsible for overseeing the of re-convening of the parliament as part of the government's policy of devolution for Scotland, Northern Ireland and Wales, and the relocation of the countries' politicians to their respective capital cities. As First Minister of Scotland, Dewar headed a newly elected administration in coalition with the Scottish Liberal Democrats, which met in temporary accommodation on the Mound in Edinburgh. This was later superceded by a purpose built parliament building at the foot of the city's Royal Mile at Holyrood, its design having been selected by Dewar after an international competition won by the Catalan architect, Enrique Morales. By the time the building was opened by the Queen on 9 October 2004, both Dewar and Mirales had died, leaving the running of its construction and funding to degenerate into the most controversial and expensive building project in Scottish architectural history. Soon after Dewar's death on 11 October 2000, the Scottish sculptor Kenny Mackay was commissioned by the parliament to create a 9ft (3m) bronze statue of Dewar, cast by Powderhall Bronze, for erecting on a stepped, circular pedestal in Buchanan Street, opposite the steps of the Glasgow Royal Concert Hall. The statue was unveiled on 7 May 2002, by the Prime Minister, Tony Blair. The latest of several statues of political figures in Glasgow, the statue depicts Dewar in a contemplative pose, with his hands behind his back as if he were strolling down the street lost in thought. In October 2005, the statue was removed for restoration after spates of vandalism had resulted in damage to Dewar's prominent spectacles and the statue had become a regular target for 'coning' (crowning a statue with a traffic cone). After being cleaned and repaired by CBC Stone and its original founders in Edinburgh, the statue was returned to Glasgow in December 2005 and placed on a 2m tall, cylindrical pedestal of polished Balmoral red granite, which is intended to prevent vandals from climbing up to the statue itself. 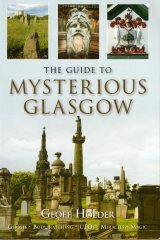 The cost of the restoration and new pedestal was �25,000, of which �5,000 was donated by CBC Stone, with Glasgow City Council contributing the remaining funding. Information on the statue's removal in October can be found in The Evening Times article 'Dewar statue set for high security', 11th October 2005, p. 7.